Oława lies 25km south-east of Wrocław. To reach it you need to drive from Wrocław down the road no 94 in the direction of Brzeg and Opole. In Oława it is needed to head for the center and then for Town Council (white information boards by the road) which has its seat in the rebuilt part of the castle. The castle was constructed by the duke of Brzesko-Legnica, Ludwik I in the years of 1359-1398. According to a prevailing fashion in 1588 the stronghold was reconstructed in a Renaissance style and next in the XVIIth cent. once again. This time it was given a baroque character. 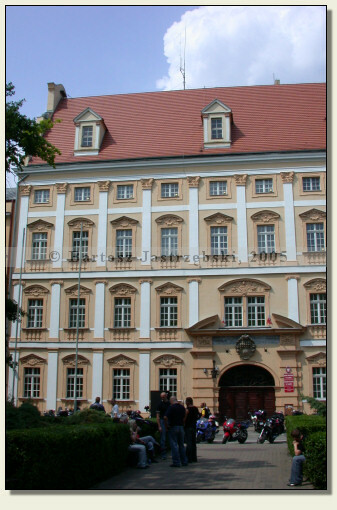 In the years of 1697-1737 the castle together with the whole duchy of Oława by way of deposit became the property of the duchess Jadwiga Elżbieta, the wife of Jakub Sobieski, whose father was Jan III Sobieski. In the following centuries the building was systematically decaying till 1945 when it was partially demolished. In the years of 1952-1958 the reconstruction of the part of the castle was made. Only former residential building as well as a tower have preserved until our times.